Over the weekend I had the pleasure of reuniting with a group of old friends to visit an ailing mentor. These relationships are sort of a second family. They've spanned nearly three decades. They've experienced many forms of joy and suffering over that time, and worst of all great periods of non-relationship. So it was that going in to the weekend, there were a couple of situations that I was concerned about having to deal with. One in particular was difficult to name, but I've narrowed that emotion down to selfishness on my part. It's deeper than that really. Much deeper. But in the end, I'm being selfish. We've had seem unskillful interactions recently. There was an exchange that turned from him showing great disrespect to me, which led to unskillful banter. That led to anger on my part for his lack of mutual respect and understanding. That led to forgiveness on my part, which took some serious practice. Upon raising the white flag with him, and telling him I loved him, he promptly fired another shot in that verbal war. The proverbial last word, if you will, at which point my forgiveness turned to a selfish desire to be understood and accepted by him. At some point I hope to write about Uppekha, which has been a huge practice when working with people like this, but that's not how I worked with my feelings on this occasion. On this occasion, I practiced "Quieting The Inner Critic". As this meditation can be practiced in any position which is comfortable, I chose a lying down position which was more convenient to my housing at the time. I called to mind a difficult emotion - in this case the selfish need to be understood by my old friend - and I watched how I felt about this selfishness. I clearly had the feeling, along with the selfishness, that I was bad for feeling this way. Per this practice, I then changed my way of viewing this as "bad" to viewing it as "painful". Once I was able to regard this feeling as painful, I was able to cradle it and show some compassion for it. As I'm accustomed to doing this with pain from my studies of Thich Nhat Hanh, who is known to talk of treating ones pain as a mother treats her newborn child when it cries, I found this fairly easy to imagine. I invited the pain of my pride, which selfishly wanted to be understood, to relax. I acknowledged it was there, said hello to it and that I loved it and appreciated it for what it was there to accomplish. I did some more practice, I won't go in to here, in the way I'm familiar with from Thich Nhat Hanh and eventually watched as this pain eased and dissipated. Once dissipated, I was left simply loving my friend and feeling a little sad for him. I was left thinking I need to practice some Mudita for him and grow this sense of happiness I was starting to feel for him being comfortable with his beliefs. I realized that I really don't need to be understood or respected by him I order for me to love him and respect his beliefs. "Reflect again on the fact that you aren’t able to prevent negative feelings from arising. You don’t need to be overcome by them, defined by them, to act on them or feel ashamed if you have them. This is just in the nature of things." "All beings want to be happy, may they be happy." Repeat the practice in this way, bringing up someone who's having a tough time, and see a time where maybe they have helped someone else. Call to mind someone you have had direct conflict with and try to see a way in which they really are a good person and not the bad person you have built a story around. After each person comes to mind, repeat that phrase. The point of this method (as I see it) is to glimpse that there might be more to things than we typically see and to learn to water the good seeds instead of the bad. The habitual practice of labeling these things as "bad" has the effect of watering the bad seeds in us. This practice helps us begin to break that habit and use that "water" to grow the good seeds in our "Store Consciousness". Human nature, or more accurately the human ego, is such that people tend to think everything is black and white, that all people are either good or bad. We say to ourselves "He did me wrong, so he's a jerk" but really there's more to that person than that one act. He might have been a jerk to you, but his kids might think he's a great father. Or perhaps he treats his best friend very well, and you just aren't that friend. Maybe that family member who has mistreated your family is extremely kind and helpful to some other family. I'm always reminded, when talking about this sort of thing, of the old 80's Boston based Funk-Metal band Extreme. They put out a concept album called Three Sides To Every Story. There were three distinct styles on each of the "Sides" of the record titled "Yours", "Mine" and "Truth". People are not actually all "Bad" or "Good". The reason I like that so much is that it points to the fact that "Yours" is how your mind sees things. "Mine" is how my mind sees things. But the truth...well, that lies somewhere between the other two and is really a combination of them both and so much more. This touches on the Store Consciousness I spoke of yesterday. We each have good seeds and bad seeds, and the ones that grow are the ones that we water. A friend of mine recently told me she couldn't meditate because her mind won't still. I responded that her mind has been practicing wandering for hundreds of thousands of hours, non-stop. It's only practiced letting go for a couple of dozen. It takes time, and it takes effort. And it takes watering the good seeds. Seeing the good. I have a dear friend who is dealing with her own health issues, while being a regular caregiver to her parents whom are both suffering from ailments of a severe nature as well. And she has a child. So, as you can imagine, she's dealing with some stress. Another friend of mine, who was a bit of a mentor to me in a long-past life, has been dealing with severe health issues for a few years. He has a caregiver who has done an amazing job in some really horrible situations. He's doing much better lately, but wouldn't be so if not for her. I went, with some friends, to visit him this weekend and her support of him was evident in his improved health. My friends and I, to whom this man matters a great deal, feel we owe his current presence to hers. There's an even more interesting story buried between those two individuals stories which helped me to see more clearly the fact that there is good and bad in all people, and that gave me deep insight in to "Store Consciousness" this weekend, but that is a whole different story. Maybe I'll get back to that some other time. Anyhow, seeing both of these two situations up close this weekend, and involving two people whom I care about was both interesting and enlightening. With them on my mind, as well as my own role as an emotional caregiver (which I am grateful to be able to do) for many people at the moment, I sat with these in mind and performed Sharon's LovingKindness Meditation for Caregivers. "Skillful caregiving depends on balance - the balance between love and compassion for oneself and love and compassion for another; the balance between opening on's heart fully and accepting the limits of what one can change. Moving our hearts toward balance allows us to care and yet still cope because of that caring." Wow. Well said Sharon Salzberg! These people (caregivers) often teeter on the edge of burnout, which Sharon also talks about, and they really are handling a lot of things. To do well as caregivers, they must find that balance, and the two examples I saw this weekend do very well given their very different but both overwhelming tasks! "May I find the inner resources to be able to give to others and receive myself. May I offer love, knowing I can't control the course of life, suffering or death. I care about your pain, yet cannot control it. May I see you as I wish to be seen, as big as life itself, so much more than your need or pain"
Read that last one again. Wow, huh? I practiced these, and the others in Real Happiness during that sit, and they really helped me feel more balanced. I hope that if you are in the position of being a caregiver - and let's face it, we ALL are in some way - that you will find comfort and balance in these practices! On Day 22 of the #RealHappiness #MeditationChallenge, I sat listening to the Guided LovingKindness Meditation provided by Sharon Salzberg in the Week Four section of Real Happiness. I've done these practices before, and I'm growing to love them more and more. In this first, introductory guided meditation to the Metta practice, Sharon guides us to wish ourselves to be to be safe, happy, healthy, and at ease. May I live with ease." May you live with (Pup) ease." May you and yours live with ease." May you live with ease." This practice, at first glance seems very easy and also perhaps a little ineffectual. As I have been practicing it more and more, I've come to realize it is neither. It is not always easy, and - practiced regularly, for long periods - I think it has the power to change your life entirely. I have some friends like @Jacklope who find it to be crucial for them. If you've had the pleasure of knowing him, you might understand how powerful this practice really can be! He has said that it has cracked open his heart and filled him with love. He's such a genuinely great guy that he positively glows with it. If he owes this to the Heart Practices, as he has said, then it's certainly worth exploring! I wrapped up Week Three of the #MeditationChallenge with 30 minutes of "Thinking Meditation". I started by settling in and feeling the ground beneath me, as Sharon suggests. Knowing that I can count on that solidity. I follow the breath, knowing that it comes and goes without effort. No need to control it. Having reconnected with a Junior High School friend via a social media site right before my sit, I had that fresh on my mind. It was thoughts of that friendship, the reconnection and the discovery that my best friend from Junior High is a Buddhist that ebbed and flowed for me during this sit. Sharon says "Our habitual tendency is to grab on to a thought and build an entire world around it, or push it away and struggle against it." and this is definitely what I was doing. Fortunately, I was able to see that, and bring it back. I was able to let it go, bring my attention back to the breath and continue. LovingKindness - Cultivating Compassion and True Happiness. LovingKindness Meditation on Seeing the Good. LovingKindness Meditation on Quieting the Inner Critic. Circle of Loving Kindness Meditation. I'll be out of town this weekend, so I'll save the Walking Meditation for then. Hopefully, I'll be with my Sangha on Sunday and we can do the Circle Meditation. Then, before you know it, this month long mediation challenge will be done, and hopefully you'll all have found benefit in the additional practice or established your own daily practice if you didn't already have one! Sunday is always my favorite day of meditation practice as it's the day I'm fortunate enough to practice with my budding Sangha. We have a small, blooming Sangha in my town and, while we're still "young" as a Sangha, we have a great group of people. I'm really lucky to have somehow, unintentionally and quite unexpectedly, found such like-minded, wonderful people! Anyhow, our format altered slightly this week. It was raining, and we had a new member, so we decided to review the basics. We used Sharon Salzberg's guided meditation from the first week of Real Happiness which contains all the things perfect for a new person. It's simple instruction and gives a touch of everything you should and shouldn't be concerned with. It is really great for starting out. Following that, we opted out of our usual garden walking meditation and decided to watch Thich Nhat Hanh's DVD on Walking Meditation. That ran longer than expected and instead of doing more meditation, we opted for chatting. So, while our meditation was on the lighter side Sunday, we had a great time getting to know one another and discussing our group and some future things such as retreats. Following Sangha, late at night, I sat for 30 minutes. Normally, I wouldn't do an additional sit after Sangha, but I felt the need for it, and I wanted to focus on the Calling Up Difficult Emotions practice in Week Three. There's not much to tell. It's basically the same as what I wrote about yesterday, but specifically dealing with difficult emotions. You call up a time in the past where you felt some negative or difficult emotion. If at any time you are uncomfortable, you can take a break by following the breath for a bit. When observing your body during this meditation, take a look at how it makes your body feel or react. Note these things. Bring them up, recognize that you can examine them without getting swept away by them, acknowledge these feelings with compassion and then gently let them go. Don't cling to them, and do not push them away. Just allow them to move on. Try to pay special attention to the fact that these emotions are not you…they are just emotions. During your daily activities, start noticing when similar feelings happen to you. You might find that you are better able to handle difficult emotions calmly because of this practice. I've said it over and over during these last few weeks, but I can't stress it enough. While I'm hopefully providing some useful introduction to this book, Real Happiness, I would strongly recommend that you pick it up and read and practice from it yourself. I keep finding myself recommending it to people, and the more I work with it, the more I feel it's a great beginning point. After a nice family dinner and some reading, I hit the cushion quite late and did "Falling Over" Meditation where I fell asleep, and then nearly fell over sideways off the cushion a couple of times! Sometimes, that's just how it is. I dozed a couple of times, and instead of beating myself up about it, or worse - giving up, I just stuck it out, started over, fell asleep again and repeated. Then went to bed. That's what matters in developing a solid daily practice. Starting over. So don't give up! Thursday, the 16th day of the #RealHappiness #MeditationChallenge, was my Tai Chi Class day. I went home after work, had dinner with the family and then headed out for Tai Chi. I didn't really want to go. I wanted to stay home in the quiet and read a book. That's how I knew I HAD to go. So I did. I had a great class and then hit the cushion as soon as I got in the door at home. Normally, I would sit around for a bit first, maybe have some yogurt first. But this time I hit the cushion right away. And I was so glad I did! My core meditation practice was extraordinarily calm and connected! I settled in quickly. Because, presumably of my Tai Chi, I was more calmed already than normal and certainly was more stretched out that I normally am before coming to the mat. I floated (for that's the best way I can describe it) in my meditative state of awareness for the entire time. I was very...un-distracted...or...present I guess. It was fantastic in its non-remarkableness. Anyhow, that was it...nothing terribly amazing to report and nothing troubling. This sit was exactly what most people probably think meditation is all about. Blissful. I hate to even say that word, because of the cliché connotation of it, but it was. Meditation, especially when you're new to it, is rarely like this I think. At least I don't know anyone who claims it to be so that isn't trying to sell you something to help you achieve it! It does happen though, and it is certainly enjoyable when it does. Just don't get attached to it! Wednesday I practiced walking and sitting meditation. For my sitting meditation I simply practiced my core meditation and it was as mundane and wonderful as usual. But, I'd rather tell you about my walking meditation from that day. It was unseasonably beautiful out on Wednesday in Atlanta. I took full advantage and made sure I carved out the time for extra walking outside. I got home, changed and hit the streets of my neighborhood. I was filled with gratitude for the great weather and neighborhood walk, but I was also extremely happy to be getting back to my routine which has been sporadic lately due to travel and weather. "I was walking to work along the Sen-gawa River, just like I did every day, when in an instant everything changed... ...But I can't really recall anything unusual, I was just walking to work." Well, it was this deeper understanding that hit me like a bolt on Wednesday! I was walking along, practicing my favorite walking meditation. I was in the middle of some gratitude sayings, or prayers if you will, about my family when I got to my Dad. I have this habit of listening to the sounds around me when I think of my Dad. I listen for the "jazz" in the sounds around me. The solo, I guess you'd say. I listen for the part my Dad would be playing if the sounds around me were his band. There's always something that rises out of it. It's the lead sounds I'm listening for, never the rhythm. Not the sirens, or cars, or cicadas. It's usually the barking dogs, or kids playing or birds singing. The things that aren't redundant. Anyhow, I guess my mind wandered for a second while I was listening for the jazz, when I slowed to a complete stop and stood there with my mouth agape. Then - and this is where I won't be able to do a very solid job of explaining it - I suddenly gained an insight. A clear, deep(er?) understanding of Shunyata. And it came from relating it to music. I realized that Music is not found in the notes, nor the space between them. It's both. Notes are spaces, spaces are notes. Form is Emptiness, Emptiness if Form. Now, this doesn't sound like any sort of great revelation and I've logically understood Shunyata (Emptiness) for some time now, but there is a difference between logical understanding and a true, deep understanding. Most teachers I've read tend to describe "enlightenment moments" as achieving a deeper understanding than a "common logical" understanding on a subject. They also caution, almost universally, not to get caught up in them and that they are no big deal. But, as this happened to me, I suddenly gained a true deep understanding of emptiness and interbeing that spiraled through my mind starting with jazz. I simply can not explain it better than that, but I guess the shortest way I can try is to say that it was like I had a little idea about how music is a great analogy for Shunyata. And then from that thought, it was like a doorway cracked open. I peeked through, and got an even better look at the idea and how it related to Shunyata. And that was when the door swung wide and I really grasped it all. Then, as Brad Warner described so well in his book, I walked through the door, and kept going on about my business. There's really nothing else you can do. I feel I've done a really terrible job of explaining this. Almost to the point that I don't feel this was even a worthwhile post. But, hopefully, someone out there will understand it. Maybe, with any luck, someone might even benefit from this sub-par explanation. But most of all, the point of this post is not about Shunyata at all. It's about Meditation and why a daily meditation practice is so important. I've been doing this 28 Day Meditation Challenge to help some friends of mine kickstart a daily meditation practice. When I try to explain to them the benefits of practice, they are so numerous, varied and wide-ranging that it gets hard to explain concisely. This sort of stair-step deepening of understanding of the Dharma is one of the greatest benefits of meditation. If anyone out there has any similar experiences, I would really love to hear about them publicly or privately. Anyone? Anyone? #RealHappiness - Day 14 - Walking Meditation; Airport Style! On Day 14 of the #RealHappiness #MeditationChallenge I hit the cushion after a LONG day of travel home from Ohio. But I decided that instead of writing another day of my Core Meditation, I would tell you about an alternate practice I did that also fit in with Sharon Salzberg's Week Two practices. In Week Two, Sharon talks about Walking Meditation and gives us a nice guided meditation to use. She even gives some illustrated instruction if needed. I've been practicing walking meditation since the early days of my practice so this is old and comfortable territory for me, but I've not used Sharon's guided meditation until now. Also, my day of travel on Valentine's Day provided me with the perfect opportunity for it! I've talked often of how much I enjoy walking in the Airport. Coming back to ATL I took the opportunity to listen to the walking meditation from Sharon as I walked the mile and a half or so from my gate to baggage claim. First off, the ATL airport is basically one big straight line. There's a train, but you can walk instead. If you choose to walk, you're treated to all sorts of interesting stuff. There's a segment that is filled with giant photos and artifacts and information about the history of Atlanta. There's a section of statues that are just amazing. It's really nice! Also, it's a great way to enjoy your travel rather than race through it. It kind of nudges you in to being more mindful and getting exercise all at once! Lastly, listening to the guided meditation added a nice component to it as well. Give it a try…next time you visit the airport, try skipping the escalators, elevators and moving sidewalks. The trains and trams. Try walking from the entrance to your gate. Make sure you have the time to do it, and then just relax and enjoy. There's something almost perversely enjoyable about walking slowly and calmly through such a hectic and frenzied environment. And best of all, you'll be sitting for a flight anyhow…this helps you get your muscles stretched and warmed before all that sitting! Let me know if you've done this and what your experience was! Sunday was Day 12, and I had a great Sangha group that day which served my day of travel well. Following Sangha on Sunday, I drove to the ATL airport, hopped a flight for Ohio, landed and rented a car, then drove two hours to my hotel. I got to bed at 1:30am Monday! So, it was a very busy day, and while I did just manage to squeeze in meditation before bed, I did not get time to write about it! So on Day 13 - Monday - I was running on on fumes. I was in the middle of America with the only coffee shop around was located in the local Hospital (That did not deter me from going). I taught class all day, struggled to find a vegetarian meal of a whole foods variety and made it to the cushion just before midnight again! I did my core meditation practice and promptly fell asleep following that. I felt fortunate just to have been able to maintain my practice under the travel load I had. I actually do really well maintaining my meditation practice on the road. I find creative ways to sit in my hotel room using pillows and couch cushions and such. It's always so quiet that I find it very easy. The hard part is finding the time when I'm on the road, but I always manage. Sorry it's not more exciting than that! I'm feeling a little out of touch though as I've not been active much on Twitter this week with my #OMCru family. Day 12 of the 2012 #RealHappiness 28 Day Meditation Challenge was Sangha day! So my meditation was varied and wonderful. A theme of Forgiveness seemed to rise from the week, so we enjoyed Gary Sanders' guided meditation on Forgiveness, followed by a 10 minute walking meditation. When we finished that, we followed it up with a nice 20 minute silent sit. I gathered and shared a handful of quotes from Jack Kornfield, before we chatted for a bit. Finally, before I carried the calm with me to the airport to fly out on business, we finished off with a poem by Hafiz. Sangha meditation is always nice and such a different thing than solo meditation. Our location, which is currently in the home of one of our members, is so perfect for our needs and she makes it so with tea, incense and her lovely home garden. It's a nice place to practice, to be sure! I was able to take that calm away with me as I headed for the airport. It served me well to have meditated prior to driving through Atlanta traffic! I hit a traffic jam and lost about an hour, but I didn't mind. I was still in a meditative state for the drive. I make it a habit, when traveling, to allow tons of time at the airport so that I'm not rushed. I've even written about it before. Often I even visit the Interfaith Chapel in the airport and meditate before or after a trip. On Sunday, once I finally made it to the airport, I enjoyed skipping the train as usual, and walked all the way to the gate. There's some really cool artwork and such you can enjoy in the ATL airport if you're willing to walk! After a great day spent with my little girl, I finally made it to the mat around 11pm. I had forgone the Body Sensation meditation the night before because I didn't trust myself to stay awake in a lying position. On Day 11, I didn't find it to be an issue since I had just finished a Grande cup of Pikes from Starbucks! With the Body Sensation Meditation, we are instructed to take note of each sensation in the body by using mindfulness to observe and simply note the state of the sensation as being either pleasant, neutral or unpleasant. The *normal* human condition is that we all cruise through our days on auto-pilot in a mindless state while experiencing all of these sensations. Whether it's driving to work, feeding the dog, listening to music or even conversing with someone. With all of these things we tend to cling to the pleasant ones, hide or resist the unpleasant and not notice the neutral ones. I settled in, followed my breath and began acknowledging the sensations. For someone like myself, who used to eat mindlessly all the time, and had a lifetime of weight issues as a result there is tremendous difficulty and tremendous benefit in this type of practice. There's nothing exciting to describe as I ended up doing my core meditation, rather than the one I had planned. Having had a very long day and not starting sit until late at night, I didn't trust myself to meditate while lying down even with my timer! I'll tell you, however, that a sitting meditation (or likely any sort of relaxing meditation) is a wonderful way to end a long day. I'm certain that I sleep much better having meditated! I've a busy day today, and then tomorrow is Sangha day! Woot! I'll see you here after my meditation tonight! And since I stated that I had nothing exciting to describe about my meditation, I leave you with the following Quote by Thich Nhat Hanh. I've had a daily meditation practice for close to two years now, so I was a little surprised by how helpful the #RealHappiness book, and indeed the #MeditationChallenge itself, were to me in the first week. While I am already sitting, it is extremely helpful to practice these different methods and writing about it here has helped me consider the practice more as well. So, going in to Week Two, I'm looking forward to the other various practices I'll be trying. With that in mind, I worked around the Body Scan Meditation last night. I knew going in to this one that I would face a challenge. A while back, I went through a period where I switched from a sitting practice to a lying down method. This created two issues for me. First, when I went back to the cushion I found it extremely difficult to sit for very long at all without back pain. It was as though I had started over. I've worked through that, and I'm back to my normal 30 minutes of sitting per day now. The other issue was that I would fall asleep at times. Because I now sit in the evenings I am, of course, more sleepy. It's far too easy when lying comfortably, to let the mind drift and then fall asleep. Knowing that I was very likely going to fall asleep, I made plans for that. I used my Insight Timer App on the iPhone (one of the benefits I referred to yesterday of using technology to compliment practice) to keep me from falling asleep, or at least falling asleep for long. I set up interval bells to alert me every five minutes. I figured may not prevent sleep, but would at least allow me to "start over" as Sharon hammers home to us! I was alert and scanned from the top of my head down. My eyes, my face where I found a lot of tension and was able to release it. And this is perhaps the true power of this kind of practice, or certainly a major benefit. One thing I've learned with all meditation is that simply by observing or bringing your attention to a feeling, it will often simply dissipate. If you have a painful feeling, sometimes just observing the feeling and acknowledging it makes it recede. If you have tension in a particular area, often if you observe it, and maybe - as Thich Nhat Hanh teaches - view your pain the way a mother greets her crying baby. The baby needs attention and she does not hate the child for crying, she cradles it and gives it attention and it immediately feels better. I made it through without falling asleep, though I certainly drifted at times, but I just caught myself drifting, re-focused on the breath and began again. It was a very interesting practice and I was happy to have done it. I've only done a similar practice once before I think when I visited the Against The Stream Buddhist Meditation Society in Los Angeles where Pablo Das led a sitting meditation in which we focused on one area and then another, cycling through the body that way. I found that one much easier as it was sitting. By the way, please keep in mind that I am experimenting with the various methods Sharon Salzberg offers in her book Real Happiness. There's no requirement to do them in the order I am doing them or even to do them all! For the Day 10 meditation I will be doing the Body Sensation Meditation. See you tomorrow! Since yesterday was the eighth day of the 2012 Real Happiness 28 Day Meditation Challenge, I decided to follow the books lead and reflect on the first week. After starting the book with some great information such as what meditation IS and what it is NOT, the first week of instruction in "Real Happiness" provides a gold mine of extremely important, deep, simple and very - VERY - useful information. At the beginning of the week, we started by talking about concentration. Sharon talks a little about how we can't change the past, and can't predict the future, and about being in the present moment. She talked about choosing a place to meditate, what to wear and a time to practice. She talks about the posture, and how it doesn't have to be perfect. About how the back is the most important part and how over time better posture will aid your practice. She gives an overview of what the week will look like. And, finally, she leads us with some guided meditations and offers some variations of practice for us to work with. At a glance, this all sounds very basic. And while it is the basics, it is anything but basic! It is fundamental information, but it's also things that you will use and expand on every time you sit. Forever. So I can't overstate how useful the basic info provided in week one can be. When they do, come back to the breath. All of these things, are supremely valuable and essential. So, with all of this in mind, my Day 8 sit was a mixed bag. I did the core meditation. I followed the breath for a while. I let go of thoughts for a while. I did "Hearing Meditation" for a while. I did Cradling the breath meditation. I enjoyed it all. I didn't choose this, I just let it happen. One thing I would like to add here, is the use of technology. This might sound a little strange when you're maybe picturing sitting with pillows and candles and bells and such, but I bring it up because toward the end of this section of the book, Sharon talks about keeping a Meditation Journal. While I have an actual bell, I have found it much more useful in my practice to rely on technology for this. I've reviewed in the past some of the meditation bell options, and there's been progress on many of them. So I'd like to reference a few options here for you to consider. I'm not promoting any of them, but actually use them all. I am sort of waiting for new versions before writing any more reviews of them, so for now I just suggest trying them out if you have a smartphone or tablet and see if you like them. More importantly, see if they HELP your practice. They should AID you, not distract from your practice! All of these are functionally great for using as a timer and bell(s). The latter two also act as meditation journals. Insight Timer is the least attractive, in my opinion, but the most functionality offering all of the above as well as a rather limited social media functionality (which if you are part of an online Sangha such as the Online Meditation Crew, makes it the most handy option). The most important thing is that they all work very well to aid in timing and tracking your practice. When I prepare to sit, I tweet my check-in to the #OMCru, I set the iPhone to Airplane mode to prevent interruptions and then I start my timer. A bell rings to start me. Three bells signal the end of the sit. A journal automatically pops up for my entry then I turn on the phone and tweet my check-out. It's painless, seamless and very, very useful to me. I hope you will find it so, as well. I look forward to the second week! I decided to utilize the "Letting Go Of Thought" practice described by Sharon in "Real Happiness". This is something I already do, pretty much since I started, but it's always good to approach it like it's new. Plus it never hurts to get different guidance on these things. "Breathing In, my mind is the great blue sky. Breathing Out, my thoughts are the clouds that pass by." I am pleased to say that I wasn't too often distracted (probably because I've practiced this considerably) but I still found myself pursuing a random thought now and then. This is perfectly normal, and happens less with time. When I did, I simply took a moment and re-focused on the feeling of the breath entering my nose and exiting. Sharon gives really good, very simple and clear instruction on this in the book. "We release a thought or a feeling not because we are afraid of it or because we can't bear to acknowledge it as a part of our experience, but because in this context, it is unnecessary. Right now we are practicing concentration, sustaining our attention on the breath." ~ Sharon Salzberg "Real Happiness"
I did this for 20 minutes and it was, as it usually is, very calming and peaceful. The last 10 minutes of my 30 minute sit, I was more distracted. Or, not distracted so much by stray thoughts I followed, but more deliberately I started pondering specific thoughts. Intentionally, I guess. For me, sometimes, this happens in meditation where I will suddenly start pondering some thing, usually a problem I've not solved, and my mind will decide that the time is right to solve it. So, for the last 10 minutes of my sit, I pondered a couple of issues on my mind. Rather than letting go of these, I decided to sort of let my mind do it's thing and work on these problems. Not really letting go of the thoughts, but rather sort of observing the solution taking place without interfering. It's rather hard to describe, but there ya go. The bell rang, and I was somewhat energized from my sit. I ended up staying up later than planned as a result. Not a bad thing, just a thing. How was your first week of the challenge? So last night. on Day Six of the 2012 Real Happiness 28 Day Meditation Challenge, I decided to focus on the "Hearing Meditation" Sharon describes in "Real Happiness". I actually do a similar practice quite often. She invites us to "See if you can hear a sound without naming or interpreting it." Simple right? I actually utilize distracting sounds as the focal point of my meditation in order to prevent distraction quite often. I started doing this early in my practice because I would wake early in the morning and meditate when the house was as quiet as it ever is. With pets, a child, a spouse and living in the city it's unavoidable to experience sounds that can be distracting. As an example, we have cats who would maybe start scratching on a post repeatedly or some such. Another noise that was very minor, but which I found extremely distracting, was the hard drive in our DVR. It would spin up now and then at odd times to record something and, me being a tech worker, catch my attention. This points to the fact that these responses are learned responses and CAN be let go of, or at least handled differently. Only because I work with computers, where a hard drive sound could signal a problem, does this give that sound enough value in my brain to cause it to be a distraction. Most people wouldn't even have heard it. So, rather than getting annoyed by these distractions, I started turning my attention on them and just allowing them to happen, then observing my reactions to them. This is been extremely helpful to me in building a practice in a distracting environment. Now, almost two years later, I have been known to meditate quite happily in the middle of a parade crowd in DisneyWorld! Well, last night, I followed Sharon's instructions around this practice and it worked well for the most part. That is, it worked well in the way that it normally does for me, where I notice the sound and observe it. Where this practice got tough for me was when I got to the part where Sharon says to "See if you can hear a sound without naming or interpreting it." This is MUCH more challenging than it sounds. This not "naming or interpreting" part is the key, I think, to the deeper levels of this practice. It's simple enough to listen and observe sounds. Getting to the point of hearing the sound, noting your response to it and then observing the space between those two is a great thing in itself. To then not identify the sound is another level of practice altogether, though! You've spent your entire lifetime learning that that sound outside is a bus, or a motorcycle or a dog barking. To now try and hear the sound, observe your reaction to it and stop yourself from identifying it is truly challenging, at least for me! Anyhow, I sat listening to the television show my wife was listening to, the cars, the animals, the planes and so forth. As I did, I realized I was paying so much attention to the effort to not identify these sounds that I was preventing myself from the rest of it. The mindfulness of it. So I relaxed, I allowed and observed. I noted the space between the sound and the reaction. And slowly, I started to glimpse the possibility of not identifying the sounds. I very much enjoyed this expansion on a practice I already use regularly. I expect I'll be spending more time on Hearing Meditation soon! I hope your practice is expanding as well! Sunday afternoon is when the Two Hands Sangha meets for it's weekly meditation group. Day 5 of the challenge happened to be our Sangha meet day, so I rolled them all in to one. In the week leading up to our gathering, I had picked up on a few loose ends of conversation and such. The theme that seemed to rise out of it all was Gratitude. I had heard each of our members expressing gratitude in various ways and for various things as well as missing opportunities to be grateful, including myself. So, on Sunday morning, I found myself with a little free time and used it to try to sew those loose threads together for a talk on Gratitude. I was looking for some poetry about Gratitude and I stumbled across a fantastic article that not only included various quotes and poems on the subject, but a TON of other great insight on incorporating Gratitude in to our daily lives. The article, by a gentleman I was not familiar with (Phillip Moffitt), was PERFECT for my needs. I ended up highlighting sections of it to discuss and had so much material that I really had to prune it down to fit it in the time frame we had. Anyhow, once I found that incredible selection from DharmaWisdom, all I needed to round out the group meet was a nice guided meditation on Gratitude. I reached out to my #Twangha (all my Twitter Sangha from all over the world, including the #OMCru - Online Meditation Crew) and asked if anyone had a suggestion. Kayla Hewitt, a great young aspiring Dharma teacher, immediately reminded me of Gary Sanders recorded meditation on the topic. It was PERFECT! So, we had our 20 minute guided meditation, followed by a beautiful 10 minute walking meditation in the gardens (Which was so lovely one member didn't even hear the bell and ran a little long enjoying the trees) and finally another 15 minute silent sit. We wrapped up with the reading from the article, and some discussion. It was truly a beautiful way to wrap up the weekend and I was FULL of gratitude for our wonderful little Sangha and my amazing #Twangha. If you don't belong to a Sangha yet - and perhaps if you're participating in the RealHappiness challenge, you might not - I would definitely encourage you to seek out one in your area. If you have good ones, that's a great thing to be grateful for! If you don't, start one and be grateful for that! ;) Best of luck with this practice, and may we all be at ease! In the words of the infamous sage Ice Cube, "I got to say it was a good day." Yesterday my little Sangha had a field trip to a local spiritual book store, followed by a wonderful lunch at the World Peace Cafe run by a local Kadampa Buddhist Sangha. My little girl got to know my Sangha mates and really connected with one of them deeply. Following that, my wife took her to a hockey game giving me some free time which I used wisely. Anyhow, it was very interesting. First off the house was so unnaturally quiet that I could hear my body (sorry if this sounds gross) digesting my dinner. So I sat with that. For some indeterminate amount of time, I followed the sounds and sensations of my body turning my dinner in to fuel, and I observed the feelings and thoughts that came with it. I offered gratitude for the process. I've never done anything like this before and it was very interesting. Eventually, I sort of fell away from that and stopped meditating long enough to launch a recent guided meditation and talk by Gary Sanders on Karuna. Thus, I ended my fourth day of the challenge, having gained insights on compassion from Gary. If you're not familiar with Gary, check out his blog, or follow him on twitter. He's recently started recording his talks and meditations and has a handful of very nice ones to listen to. After a busy Friday at work, and a hectic evening, my wife reminded me at nine that I was normally sitting by then. I hurried off to the bedroom, to the cushion, tweeting my check-in with the #OMCru on the way. By the time I got settled on the cushion it was 9:03pm and I was really glad to be meditating. I listened to a short guided meditation from the Real Happiness book, and when it ended I just sat following the breath. It was a peaceful, uneventful sit with my attention drifting from one are of my body to another and observing. Before I knew it, my timer bell went off and I was done. Some days it goes by quickly like that. It's almost hard to believe that 30 minutes has passed. Samu: Work service (in the sense of sutra service); meditation in work. My daughter has recently started meditating with me for 5 minutes at a time. It makes me unimaginably proud to see her sitting by me in perfect, simple meditation. So funny that kids take so very easily to it. Obviously, for them, the hardest part is sitting still but the posture and instruction comes very easily. Anyhow she's started sitting with me for five minutes, now and then, before bed. Once she goes to bed, I usually do my full 30 minute sit. Last night, on day two of the Real Happiness 28 Day Meditation Challenge, she was up far too late. She insisted that she wanted to meditate with me, which I thought was just a stall tactic for bedtime. She had already gone to bed and just wasn't asleep yet. I told her that I would meditate first and she could come in afterward if she was still awake. I expected she would fall instantly and deeply asleep as usual. To my surprise, she did not. She called my wife while I was about half way through my meditation, and asked her if she could come sit with me. My wife quietly brought her in, and they sat together behind me, while I finished up. So, Day Two of the Real Happiness Meditation Challenge was not as smooth as I would like for it to have been. But that's the practice. It simply IS whatever it IS. 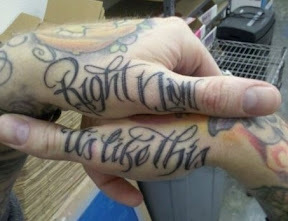 As my awesomely inked buddy Gary Sanders' tattoos (and blog) say..."Right now, it's like this." So don't worry so much about your posture being perfect, or the noises, or the interruptions. Just sit. Daily. And start over. "I am spiraling backward through space, and my "self" is not coming along for the ride!" was the first thing I *thought* during last nights meditation. Of course, as soon as I *thought* it, I snapped back to *normal*. I read Sharon Salzbergs "Real Happiness" several months ago, and liked it a lot. I found it to be down to earth, simple and very useful for anyone new to meditation or looking to refresh on the basics. I had already been meditating for almost two years, so I can't say the book was new information for me. I already have a daily practice, and I think the book is primarily aimed at someone looking to get started and build the habit of a daily meditation practice. That said, I really liked the format of the book, and I immediately bought a copy for a friend who had just started thinking of meditating. I had it drop-shipped to her and she LOVED it! She really found it to be a very easy to read and accessible book. She's not a Buddhist, and is completely new to meditation, so this was a great review coming from her! I've since recommended it to all of my fledgling Sangha members who are trying to get a regular (regular being the key word) practice going. Anyhow, last night was the first meditation I had in February and I decided to take part in the challenge. It was interesting and boring as usual. I sat down at 9pm, checked in with the #OMCru (Online Meditation Crew) on Twitter, then launched my Insight Timer app on my iPhone and began my sit. Almost immediately I had one of those interesting little events that one can experience. As mentioned at the opening of this post, I felt as though I was spiraling backward through blackness, or space, in a slow lazy spiral. In my mind, I could sort of *see* my thoughts - or at least what I perceived as my thoughts - staying where *I* was. It was a very strange thing that I have not experienced before. But the moment I noticed that this was happening, and thought "COOL!" the whole thing slowly evaporated leaving me just sitting there with my eyes closed watching my thoughts come and go as usual. Oh well. One of the things I have read in nearly every book on the subject is not to get attached to these odd little things. They are just part of the mind and ego doing it's thing. Or, as Jack Kornfield's teacher Ajahn Chah told him (from a story in "Bringing Home The Dharma") "Good. Something else to let go of!" The last half of my sit went by with the usual monkey mind and mindfulness and when it was done, I decided to post a quote from the book "Real Happiness" on my Tumblr site and I also decided that I would blog daily here during February about my daily practice. I imagine most of the posts will be a lot shorter, as my sits are usually more mundane. Mostly, I hope that anyone reading this might have some curiosity about meditation and choose to join the Meditation challenge. Just because you're late, doesn't mean you can't start! Much more important than the challenge, however, I would highly suggest the book, and I would also HIGHLY suggest finding support wherever you can and getting a daily practice going. The Online Meditation Crew is a PHENOMENAL resource for support, especially if you don't have anyone to practice with in the real world. The folks in the OMCru are more than willing to welcome you and support you with tweets or Facebook or G+ posts. I've made some great friends, even *IRL* friends through it, and it's an invaluable resource you can tap in to for support. If you do take the challenge, and you do use Twitter - perhaps in conjunction with the OMCru - be sure to use the hashtags #RealHappiness and #OMCru to find all the folks doing the same!